The Holly Group is located in the Hovenweep National Monument in southwestern Colorado. Hovenweep National Monument is comprised of 6 discontiguous acreages that protect groups of ancestral Puebloan ruins. Each group of ruins are ensconced near canyon rims where remarkable masonry skills were used to contour the structures to the irregular shapes of boulders and recesses in the rocks. Hovenweep is a Ute word that means 'deserted valley' which aptly describes the surrounding area with all the villages of ghostly ruins. Before attempting to visit the Holly Group it is best to begin at either the Hovenweep Visitor Center or the Anasazi Heritage Center and pick up a map and brochures. A map can also be printed from the Hovenweep website before leaving home. The turnoff on CO 10 that leads to the trailhead isn't well marked. As you can see from the map the turnoff is about 4 miles east of the Hovenweep Visitor Center and 4.5 miles west of the Painted Hand/Cutthroat Castle turnoff. If you are coming from the east and you get to the Utah/Colorado border then you have gone about .6 miles too far. After turning onto the dirt road it is about 1 mile to the trailhead. The dirt road should be passable by passenger car during dry weather as far as the Horseshoe/Hackberry trailhead but it is much rougher beyond that point to the Holly Group. The official trailhead for the Holly Group is 8/10 of a mile past the Horseshoe/Hackberry trailhead. If you are driving a passenger car with low clearance you will want to park there and begin hiking. A high clearance vehicle, that can be 2-wheel drive in dry weather, is required to make it all the way to the Holly Group trailhead. We drove our 2-wheel drive vehicle on a rainy day and parked about a 100 yards away and walked the rest. The trail leading to the ruins is well marked and easy to hike with only minor variations in elevation. The first pueblo along the trail is the remains of Tilted Tower. 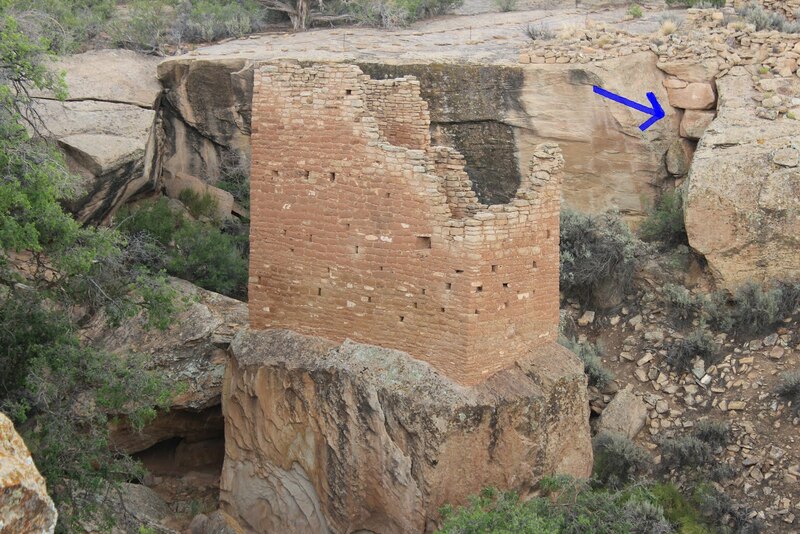 Part of the ruin was built atop a boulder that eventually slipped causing the upper walls to be thrown into the canyon. It is believed that this movement of the boulder occurred after the site had been abandoned. It is interesting that the lower parts of the walls are still securely fastened to the rock. The Holly Group ruins of Hovenweep dominate the head of Keeley Canyon where a natural seep provided water for its inhabitants. Holly Tower is perched upon a huge boulder in the base of the canyon with Holly House sitting on the rim across the canyon. It boggles the mind that this structure was built at all yet alone that it has stood for all of these years. The tower has had some renovation work completed to stabilize it. The work was done by modern day descendants of the ancestral Puebloans using the same techniques that were used in the original construction. The juniper log in this photo of Holly House is a remnant of the original construction. A true testament to the durability of hard wood in a dry climate. You also have to admire their mixture of clay, ash and water used to make the mortar. There is a trail junction near Holly House where one branch leads to the campground at the Visitor Center 4 miles away and the other branch leads to the Petroglyph View. This site appears to be a solar shrine/calendar site. Beneath the overhang are 3 circular symbols. Two symbols are spirals and the 3rd is the sun symbol which is made from concentric circles. On the summer solstice a shaft of light bisects the solar symbol and the 2 spirals. If the masonry skills didn't inspire your respect for these people then maybe this solar calendar will clinch it. The large rocks in the crevice beneath Titled Tower don't look like they occurred there naturally. You can get a better look if you click on the picture and enlarge it. The Holly Group of ruins seem to have been built with defense in mind. The Holly Tower seems impregnable and like the Square Tower near the Visitor Center it appears to guard the canyons seep. It is hard to imagine that life was all peace and bliss with the ancestral Puebloans and other inhabitants when throughout the southwest you find so many sites built with defensive walls and towers or located in protected alcoves with granaries that are either hidden from site or almost impossible to get to. Perhaps marauders were a constant threat that they had to contend with. Societies seem to have always been plagued with those that prefer stealing over honest labor. My conjectures aside, the Holly Group is worth the trouble that its remote location might present to see the architecture and solar site and to marvel and imagine what life may have been like for its citizens. If you would like to see it for yourself then all you have to do is 'Take a hike'.